If your QSO is not confirmed. I normally send an email stating reasons why. Any postage enclosed is then donated to a charity of my choice. Please note I do not work contests under any circumstance and if you worked me on SSB on frequencies 14 Mcs and above it was probably a pirate! With a new Yaesu 450A rotator replacing the Daiwa 7500 which was not faulty anyway! The upper mast bearing had seized during my inactivity following medical problems and thanks to VK6MS Trevor, for his assistance in getting the job done. I also celebrated my 75th year by ascending the mast to recover the control cable and re-terminate it. Nov 2013. I have received DX cards for SSB contacts on 80 and 40M Note: I do not work DX SSB on any band only CW. 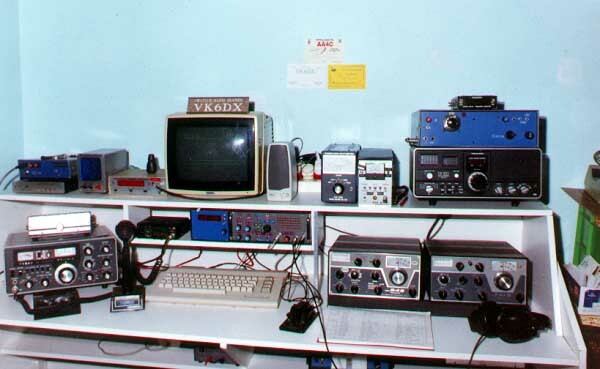 Coming soon new photo gallery and 50 years in Amateur Radio. Shack is in process of undergoing major overhaul.including up grade of FT101E to digital dial read-out. Watch here for new updates. Recently added to shack Icom IC751A. 09/10/2013. The first photo is of my most recent setup indoors, originally the "shack"was a brick and tin shed outside which became a furnace in summer and a freezer in winter. left click to enlarge photos. No1. shows FT101E and Drake Twins, main transceivers. The SB200 linear is to the left out of sight in a specifically designed unit with antenna switching unit and PWR/VSWR metering. One of three transceivers may be selected. Above the Drakes is a Realistic DX200 RX and above that is a home brew mobile unit SSB/CW 100w out 12v operation. Originally this was a Royal Flying Doctor radio. Completely rebuilt with internal VFO on 80/40m, an internal CW keying CCT with side tone. Far removed from the original Codan 6801 made 20 years ago. CPU is a Commodore C64 used with the MAP64 program for CW/RTTY. I have yet to find a PC program as good as this program, which is on an eprom module plugged into the serial port. Central is an Icom 28A VHF unit accompanied by a homebrew vox/keying unit, rig selection control and a four stage audio/notch filter and amplifier for CW. This can totally control any of three rigs at a flick of a switch. Far left is a homebrew VHF rig and modem used for packet. Next to the dummy load is the RTTY coder/decoder. No2. Shows yours truly. The SB 200 Heathkit Linear is just to my right in a separate unit, with the antennae distribution box. No3. 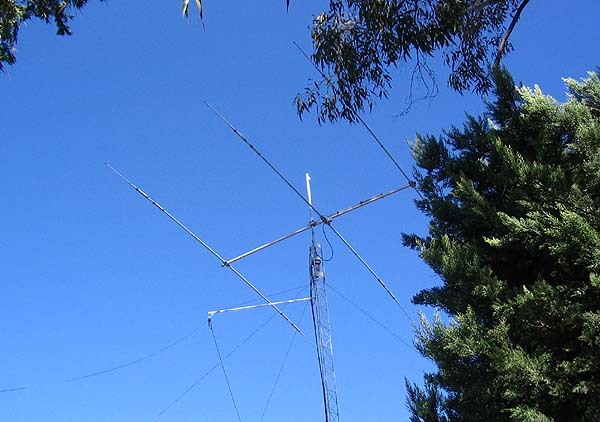 Photo of Tribander Hygain Antenna with the 40 metre Inverted V on outrigger.The Tribander is 35ft above ground level - extended mast has pulley for servicing antennae and is also used as a "gin Pole" to erect/disassemble mast. The rotator is contained in a home constructed cage with additional upper bearing. The new Yaesu 425A rotator is working well and at present I am constructing a mast for a home brew 6M 4 el yagi which wil;l be also controlled by a second 425A rotator. This page is undergoing modifications will new information and photos. I need one of those round tuit things :) . VK6DX call issued in 1968. 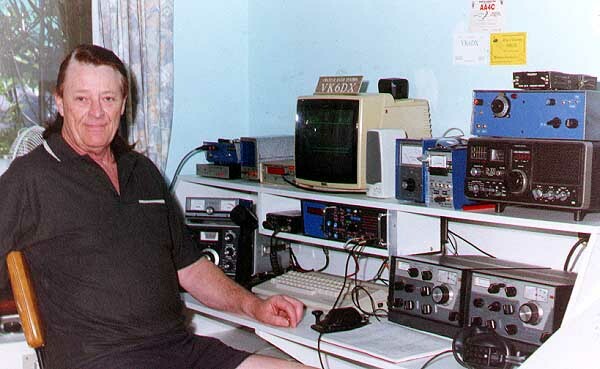 In Western Australia have been employed in Broadcast and Marine Radio engineering. Marine Electronic instalations of Radars, Scanning Sonars and Auto Pilots. I also hold a Marine Operators certificate. USA QSL manager Bob NN4I QTHR OK-QRZ or Via Bureau/Direct QTHR. QRZ.com Info pages are correct for NN4I and VK6DX contact.